of the Written Word - The Handpress World, vol. 26). ISBN 9789004245471. 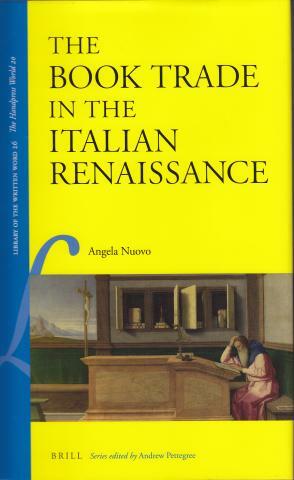 This work offers the first English-language survey of the book industry in Renaissance Italy. Whereas traditional accounts of the book in the Renaissance celebrate authors and literary achievement, this study examines the nuts and bolts of a rapidly expanding trade that built on existing economic practices while developing new mechanisms in response to political and religious realities. Approaching the book trade from the perspective of its publishers and booksellers, this archive-based account ranges across family ambitions and warehouse fires to publishers' petitions and convivialbookshop conversation. In the process it constructs a nuanced picture of trading networks, production, and the distribution and sale of printed books, a profitable but capricious commodity.